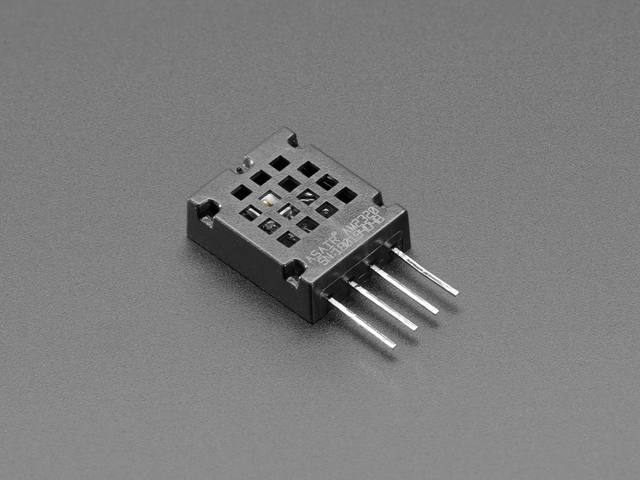 This little sensor looks an awful lot like the popular DHT11/DHT22 temperature and humidity sensors, but unlike classic DHT sensors, it has an I2C interface! That's right, you do not need to use a bit-bang timing-specific protocol to talk to the AM2320, it uses plain-old-I2C. Whew, that makes things a little easier, doesn't it? But! We'll let you know, this sensor is not well documented like our other, fancier I2C temperature & humidity sensors. The datasheet mentions it has 3% humidity accuracy and 0.5C temperature accuracy, but we're not very trusting of the specifications. So, while this sensor does seem to work, it's not recommended for anything where you care about any sort of guaranteed accuracy. Temperature is probably correct to 2-3 degrees Celsius. Humidity is probably within 5-10%. That said, for maker and IoT projects? You can't beat the simplicity and price! And we've got ready-to-go working Arduino and CircuitPython code to use it. Each order comes with one AM2320, a low-cost temperature and humidity sensor. You just provide any microcontroller that can run our Arduino or CircuitPython library, and two I2C pull-up resistors (not included). This guide was first published on Mar 07, 2018. It was last updated on Mar 07, 2018. This page (Overview) was last updated on Apr 22, 2019.